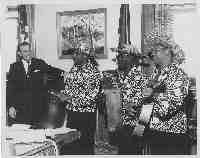 Harold Richardson, along with Count Lasher, may have been the very best singer in mento, or, at least, my favorite. 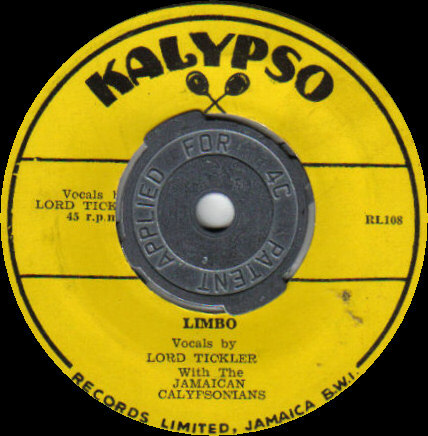 His voice is a country voice -- a mento voice -- high, nasal and endlessly expressive (and no doubt a major influence on Stanley Beckford ). 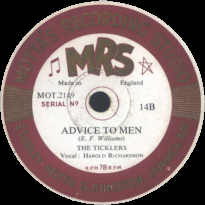 Throughout his recording career, which began in the early 1950s, Harold often performed with his group, The Ticklers. The other members of this trio were Danny Slue (a.k.a. Lord Danny Boy) on rumba box and Charles Sang on guitar. Harold also recorded as lead singer for a variety of other groups. 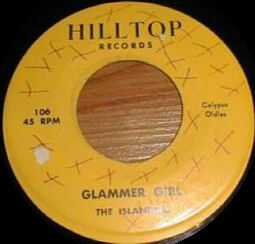 His career extended into the 1960s when he appeared on some middle period hotel LPs and singles. Sadly, this talent died too young. On December 5, 1965, he passed in his early thirties. 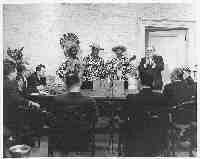 This last piece of information came from Annmarie Prendergast, Harold Richardson's daughter. She also provided information about Harold's family. 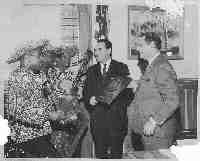 He was married to Joy (nee Tewari) who still resides in Jamaica. 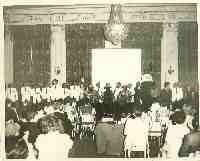 The Richardson's had 5 children, one boy (Harold Junior, the eldest child) and Annmarie and her three sisters. 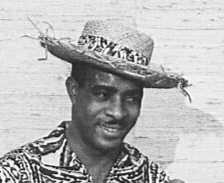 Says Annmarie, "If he were alive he would cherish the fact that he currently has 12 grandchildren and 4 great grandchildren. Two of us children sing, and one grandchild sings even better than we all put together." 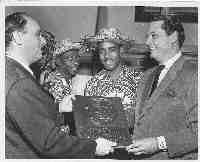 Another mento star, Hubert Porter, was a close family friend. The eldest child was just 15 when he passed. "All we ever had of him were the memories of his beautiful voice charming my mom and us at times." 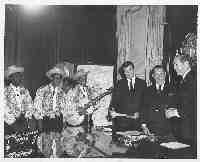 One of the grandchildren, Tamara Naar, sent me a family heirloom: the wonderful gallery of photographs below. 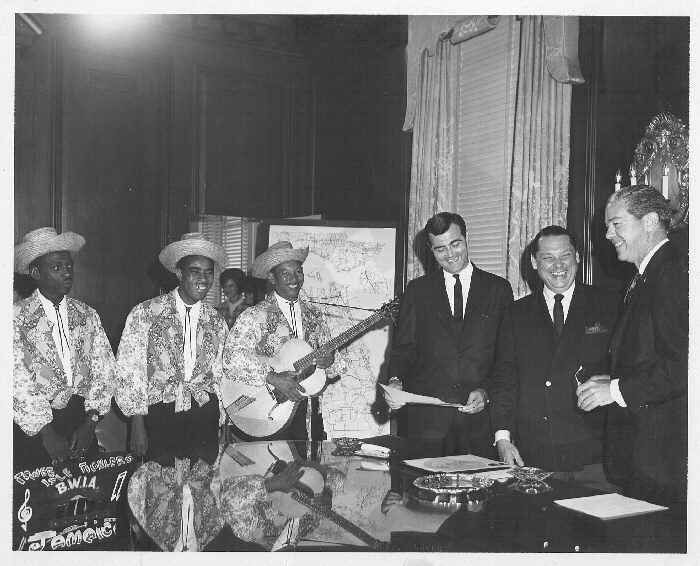 Notice the big smiles on the faces of the people photographed with the band in many of these photos. Apparently few musical groups lived up to their name as much as The Ticklers. The Ticklers on one of their visits to the US. 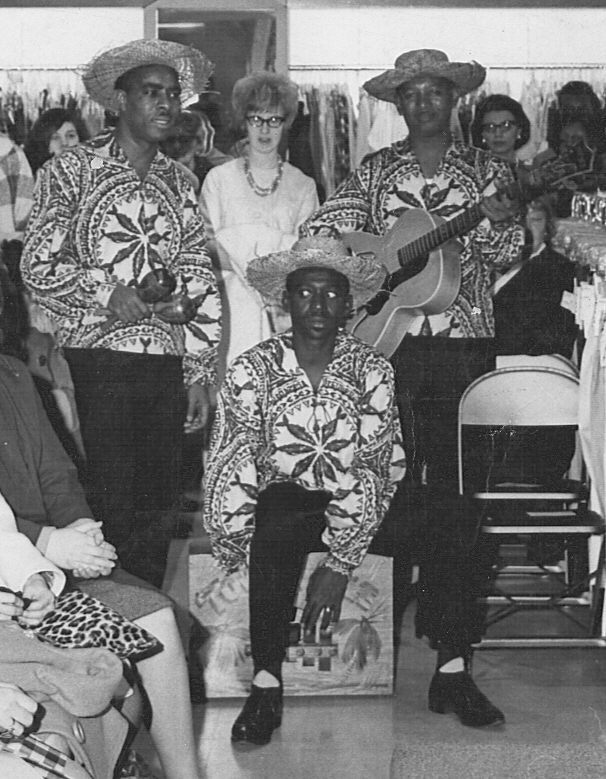 The Ticklers at Fashion Show at the Carson, Pirie, Scott building in Chicago. Above and following, two additional photos from The Ticklers trip to Montreal. The Ticklers in the USA. 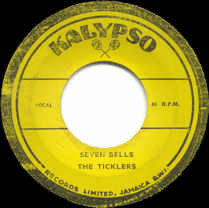 The details shows the rumba box to read, "Tower Isle Ticklers, B. W. I. 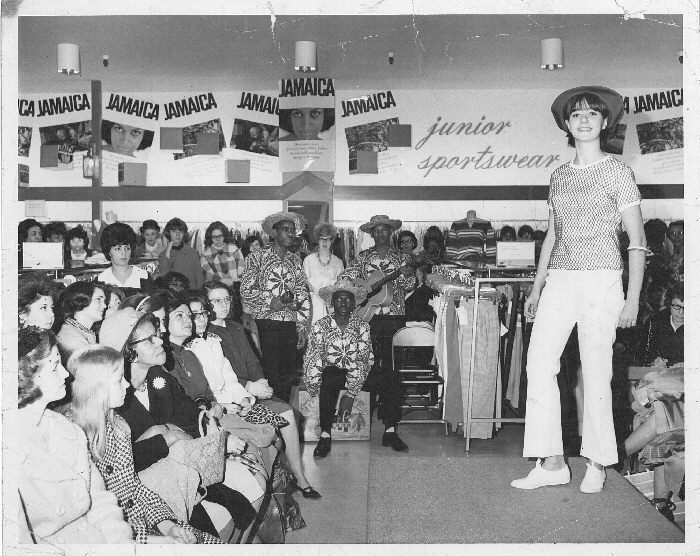 A., Jamaica". 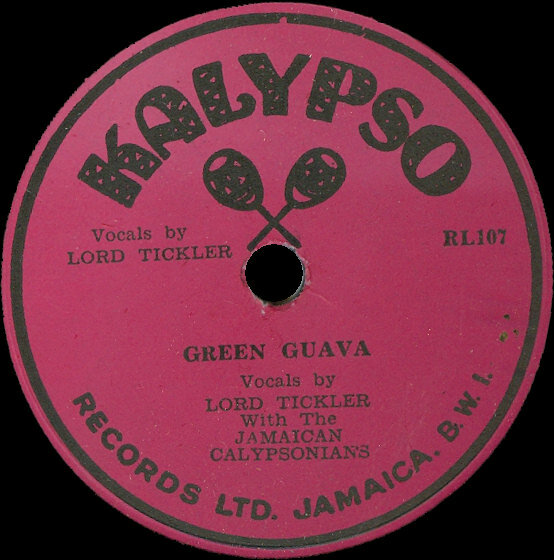 "At the top of the list"
Some sources dubiously claim that this is the first Jamaican mento record, even though the label numbering would indicate otherwise. But if not the first, it is certainly one of the greatest of all mento singles. 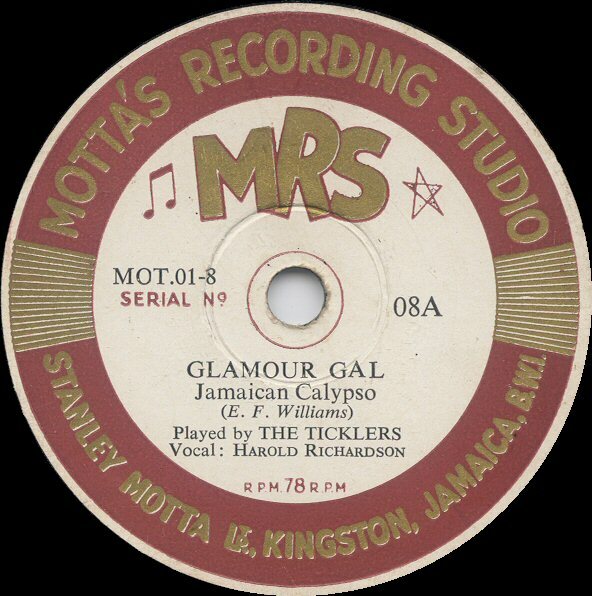 "Glamour Gal" is a rich slice-of-life song, as the country-voiced Richardson marvels at the ways of the beauty parlor set in Kingston. A number of popular hair styles are listed, and such fashion accessories as false beauty marks, padded bras and bleaching cream are discussed! 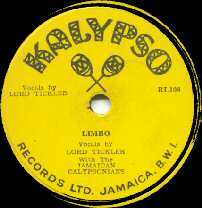 These lyrics are by E. F. Williams, who was a member and the lyricist for Chin's Calypso Sextet. 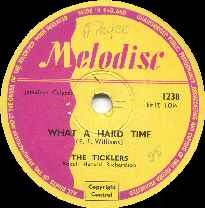 Williams' name would appear on the b-side of this single and other Ticklers singles as well. 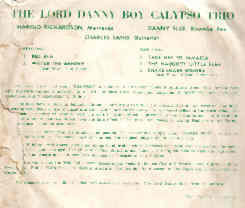 Dan Neely's liner notes for the Chin's Calypso Sextet CDs confirms that Williams wrote the lyrics for "virtually everything Harold Richardson and the Ticklers recorded". 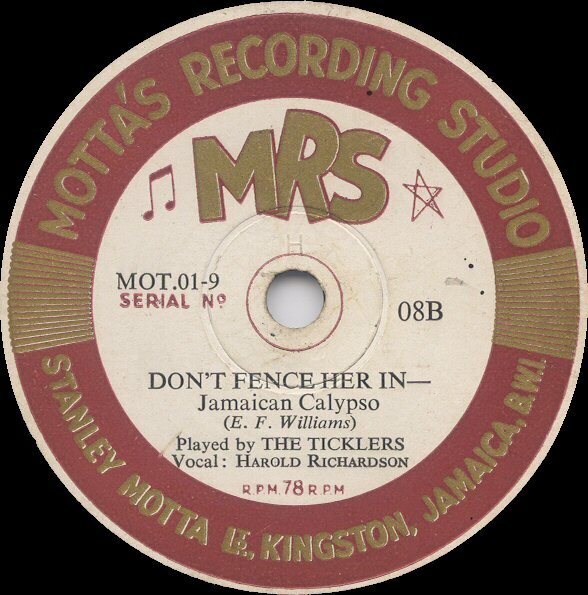 Them dem call that the "beauty pose"
And when you touch dem, dey say, "no badda me"
In Don't Fence Her In, advice is offered on the right way to treat a woman. 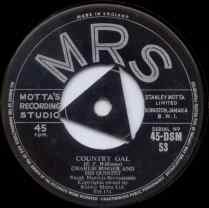 Again, a simple arrangement, outstanding vocals and great lyrics equal a classic original mento side. The same sparse arrangement is employed as on the flip side. Hereafter, prominent clarinet would be heard on HR&T singles. 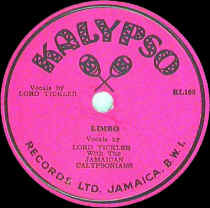 This was played by jazz talent Bertie King. Because it's a favorite track and was out of print when I posted it, here is a song clip of Don't Fence Her In. 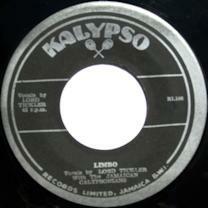 The track can now be heard on the double CD collection called "Jamaica - Mento 1951-1958 as seen here. Special thanks to Robert Lea of Spanishtown, Jamaica for transcribing these lyrics for the readers of this web site. 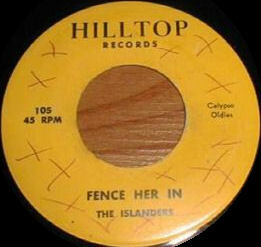 At some point, this classic single received a shoddy re-release on the US-based Hilltop Records label. Both titles have errors and the artist credit is wrong. 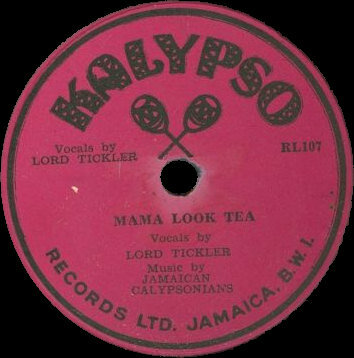 These tracks add Bertie King's clarinet to the arrangement, giving the sound something of a quaint, old-time feel. "Four Days of Love" is a charming track, where Harold sings about a number of terms of endearment. 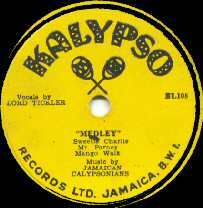 Has there ever been a sweeter vocal delivery in the history of Jamaican music? "Healin' in De Balm Yard" is another E. F. Williams-penned classic. It's about a piece of land that can work healing and black magic spells, if you pay a price to the balmer. Clarinet, piano and percussion give this song a handsome urban arrangement. And, as always, HR's vocals are a pleasure. 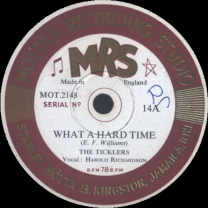 "Healin' in De Balm Yard" can be purchased on the recommended compilation CD, "Mento Madness". 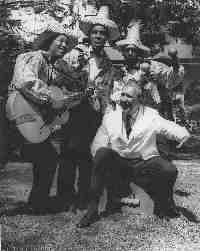 Because it's a favorite, here is a song clip of Healin' in De Balm Yard, made part of this site before the song came back into print. Special thanks once again to Robert Lea of Spanishtown, Jamaica for making a number of corrections to what I had originally transcribed below. and let me heal you in the balm yard"
The Calypso Bouncers is an unfamiliar name, and this rural band does not sound like the same musicians that play on Richardson's other recordings. 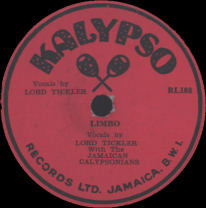 Both tracks are written by R. Thompson, who has written asides for various golden age mento singers. 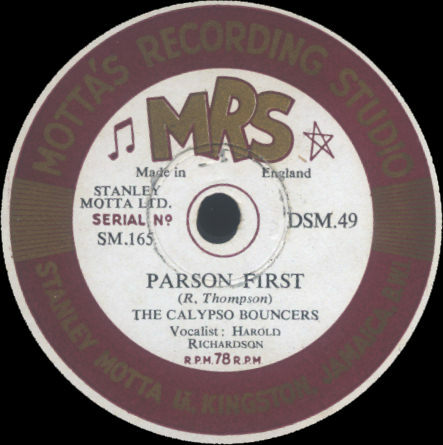 In "Parson First", Harold sings "I don't want to stir up strife, but why parson first must kiss the bride?". He worries that the parson will make an appearance at the honeymoon. 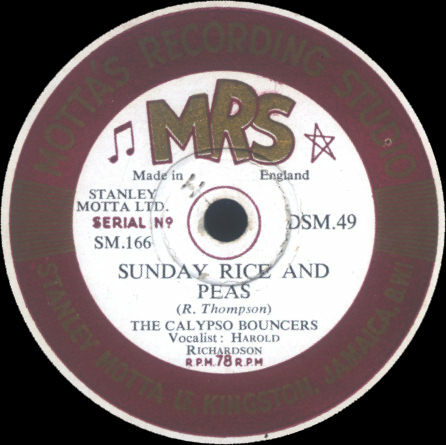 "Sunday Rice and Peas" is a tale about a man demands a particular dish for dinner on a particular night of the week. One side of the above record, "Hard Hearted Lover", on the original MRS 78 RPM release. The other side, "Parish Gal" can be heard today on the 2006 CD compilation, "Take Me To Jamaica". "Jamaica Is The Place To Go". 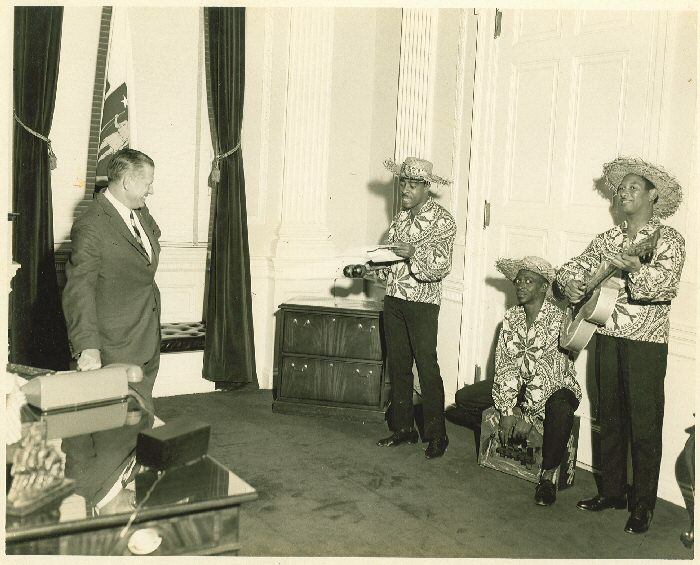 Charlie Binger and His Quintet provide a somewhat more urban sound, featuring electric guitar. 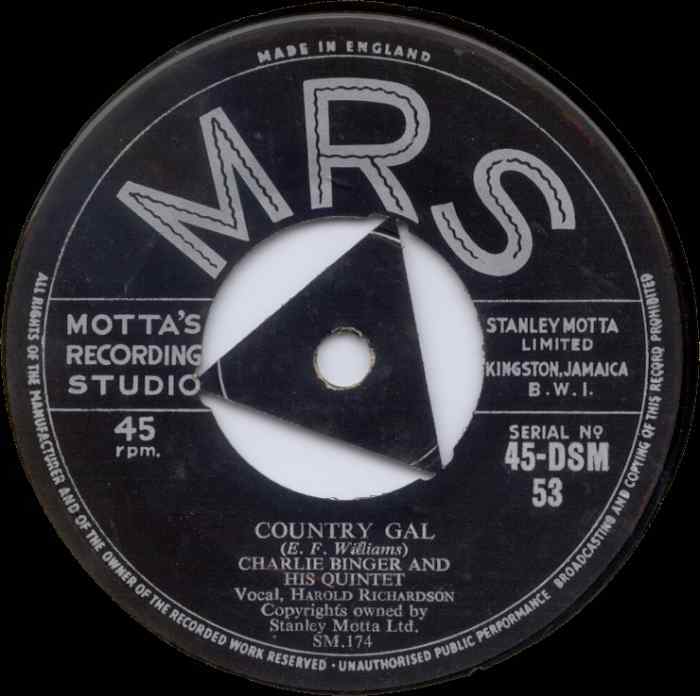 "Country Gal" is a sequel of sorts to "Glamour Gal". It can be heard on the compilation CD, "Mento Madness". 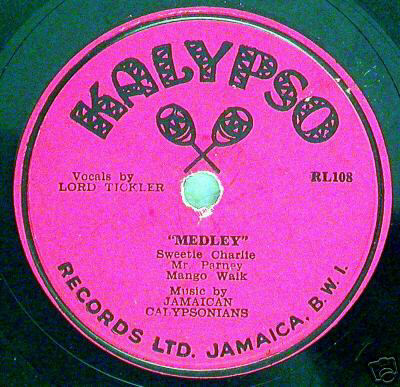 "Jamaica Is The Place To Go" features lyrics that advertised Jamaica as a tourist destination. 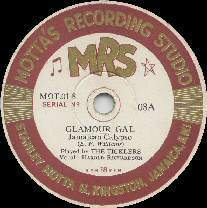 This was a very popular theme in mento's middle period, well as the golden age. 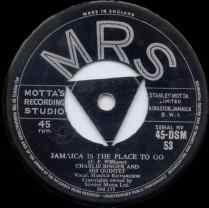 Here is a sound clip for "Jamaica Is The Place To Go". 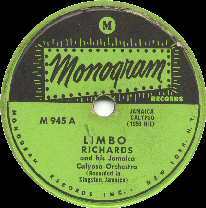 Starting with four more scans, courtesy of Richard Noblett of London, is a common yet confusing release by Harold Richardson. "Limbo", backed with either "Mama Look Tea" or "Medley". The only thing consistent is the recording of "Limbo" as also found on the CD compilation "Dip and Fall Back" (which also includes "Medley"), both Valmark CDs and on the Monogram LP, "Meet Me In Jamaica". Both flip sides are both found also on the Monogram LP. On those releases, the artist is not credited. 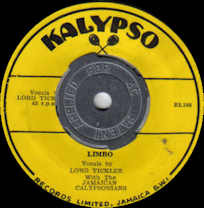 On the original singles below, the artist is mis-credited, though in both cases, clues are dropped. 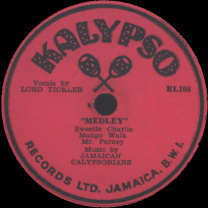 The instrumentation features piano, clarinet and several percussionists. 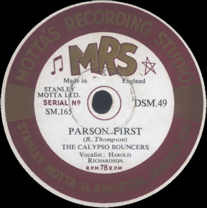 First, here is the single re-released on the NYC-based Monogram label. 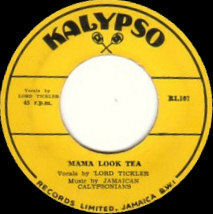 The b-side is "Mama Look Tea". Richards and His Jamaica Calypso Orchestra. 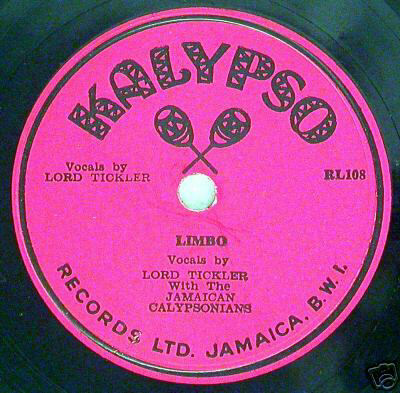 Here is the single on Kalypso, but with a medley listed as the flip side to "Limbo". But in actuality, "Mama Look Tea" is heard again rather than the medley. 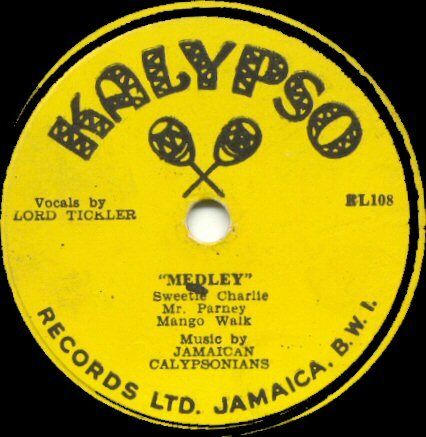 "MEDLEY Sweetie Charlie, Mango Walk, Mr. Parney"
though "Sweetie Charlie" comes last, not first. 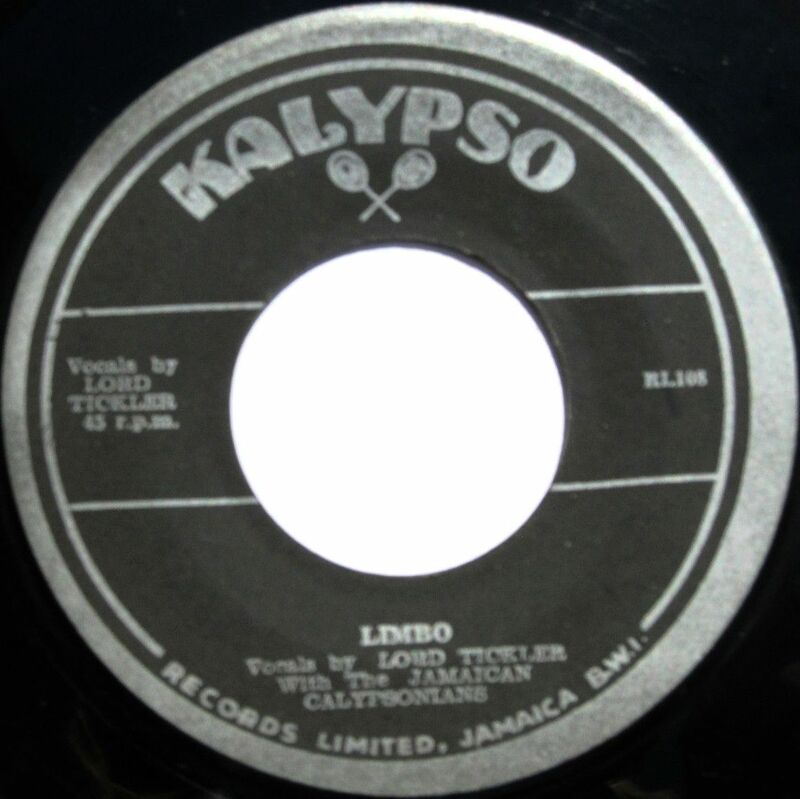 And finally for no other reason than a splash of color, here is the same Kalypso single with different pigmentation. I'm not sure whether the label is accurate on this particular specimen. Four "Lord Tickler" tracks, "Green Guava", "Jamaican Medley # Five (Jackass/Ya Ma Mama Ma Ma)", "Limbo" and "Medley: Mango Walk/Give Me Back Me Shilling/Sweetie Charlie" can be heard on the 2006 CD compilation, "Take Me To Jamaica". 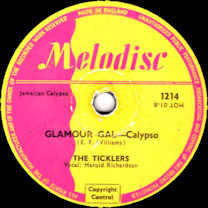 Courtesy of Richard Noblett of London, here's a 45 RPM single on the Kalypso label billed to The Ticklers . 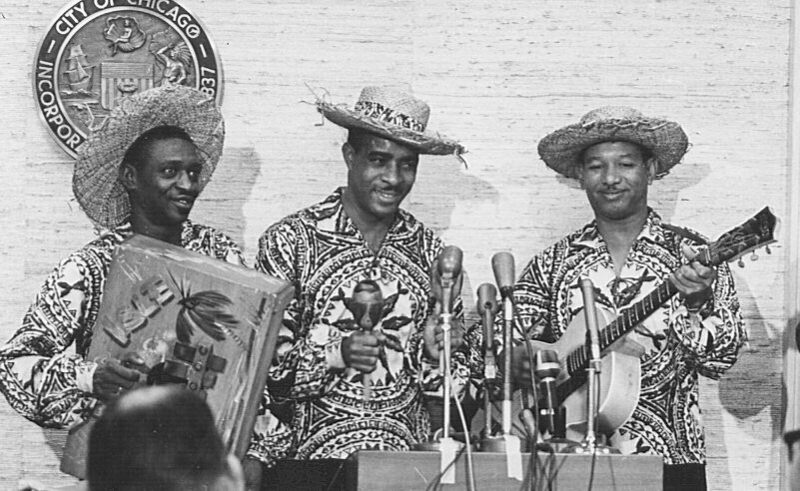 Thanks to Richard , I can describe their sound. 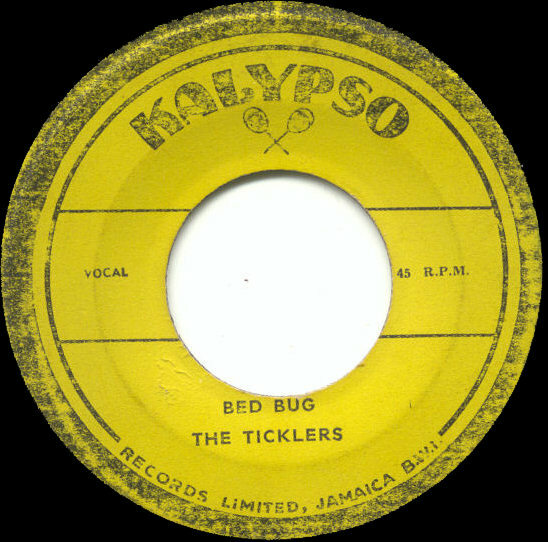 On "Bed Bug", The Ticklers share lead vocal duties. On "Seven Bells" (an update of "Seven Veils"), Harold Richardson takes lead vocals. 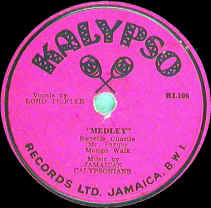 Both songs feature many new lyrics for these familiar songs. 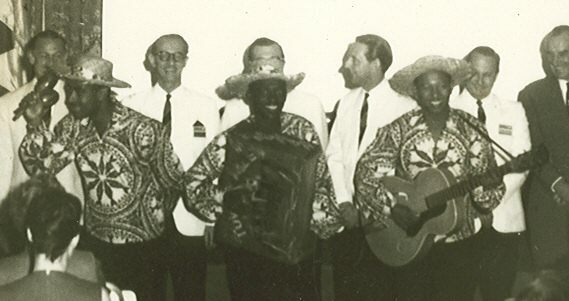 Vocals on both tracks are backed simply by acoustic guitar, bass and maracas. 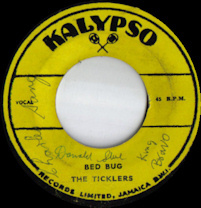 From this autographed copy of "Bed Bug", we can see that King Bravo filling in for Harold Richardson. 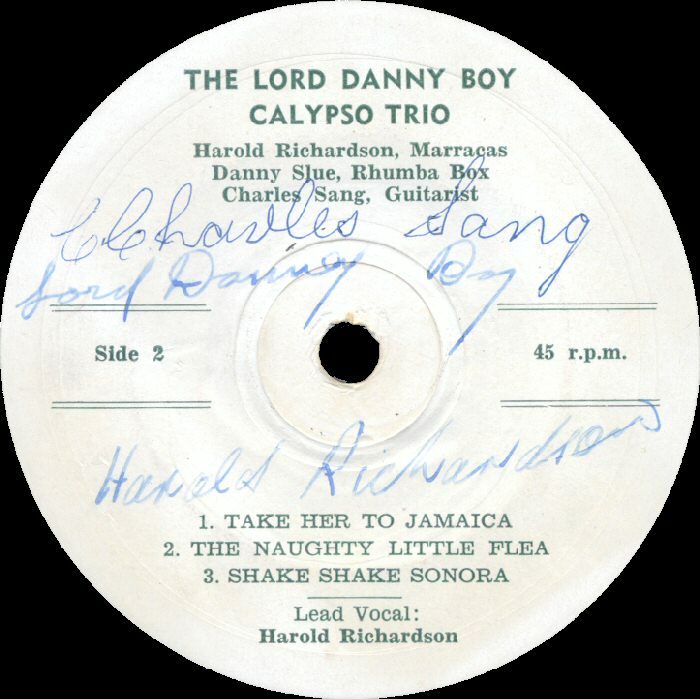 Harold Richardson appeared on the "Tower Isle Hotel" LP on the Tower Isle label. 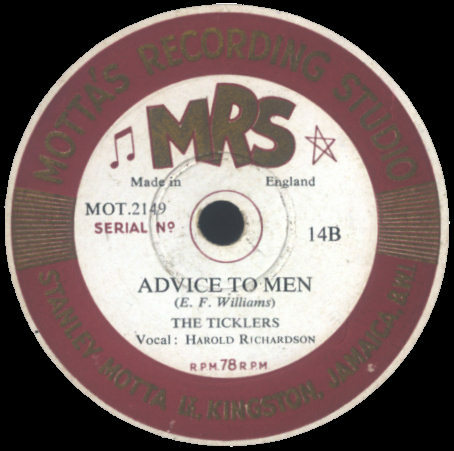 It includes, amongst a variety of other sounds, three songs voiced by Harold: two dance band mento tracks ("Slide Mongoose" and "Liza") and a ska track ("Nice Girl Ska", which is a ska rendition of "Brown Skin Gal"). 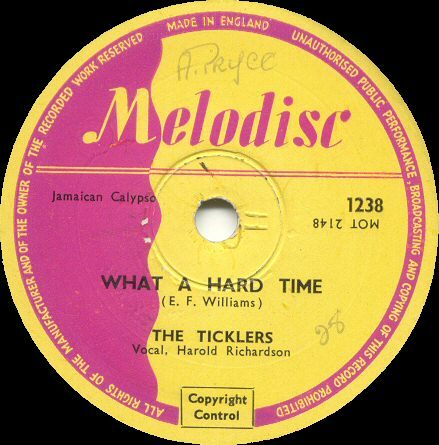 There is also a song that veers towards cocktail jazz voiced by Harold's fellow Tickler, Donald Slue. 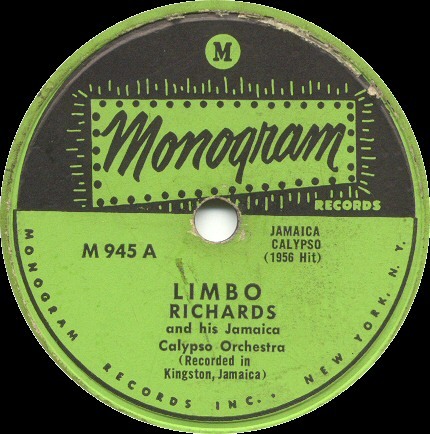 For more on this LP, visit the "More Middle Period Album Scans" page. 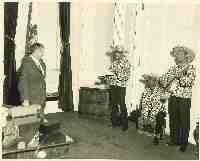 Also on that page are scans of another LP from the Tower Isle Hotel. 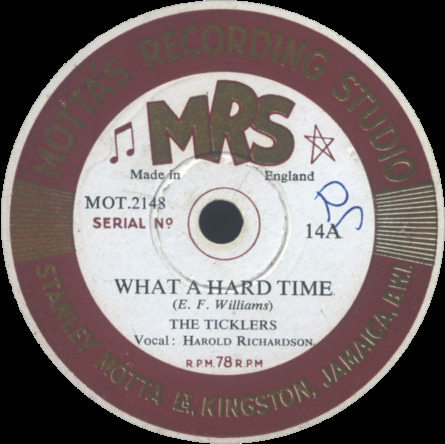 Although I haven't heard this LP, the liner notes explain that Harold Richardson and The Ticklers appear at that hotel and on this LP. Side 1 has two tracks, sung by rumba box player Danny Slue: "Bed Bug" and "Water The Garden"
Side 2 has three tracks, sung by Harold Richardson, who plays maracas on this release: "Take Her To Jamaica" (a remake), "The Naughty Little Flea" and "Shake Shake Senora". 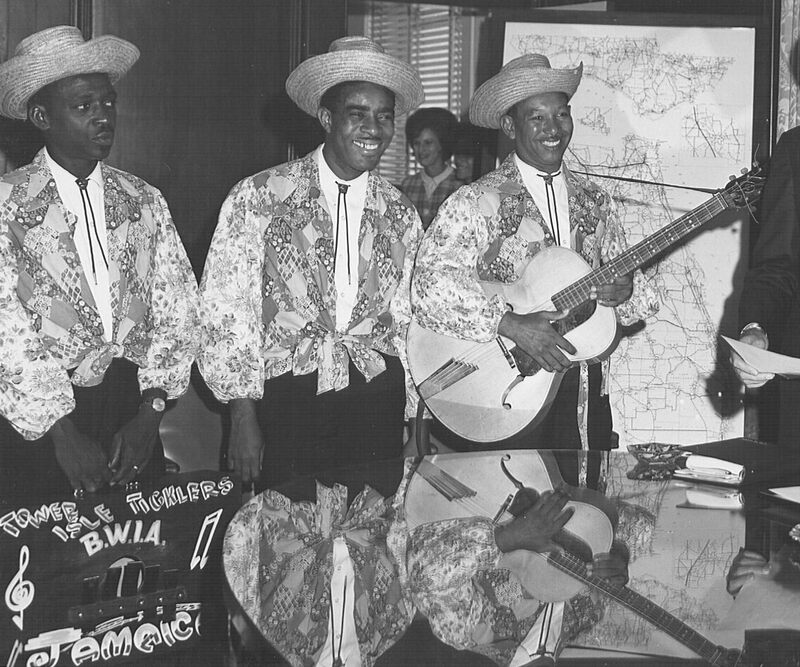 The trio is rounded out by guitarist Charles Sang. 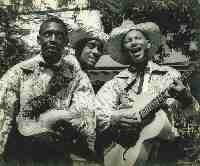 The instrumentation is kept folk-simple (just acoustic guitar and maracas) so that the lead and harmony vocals are emphasized. 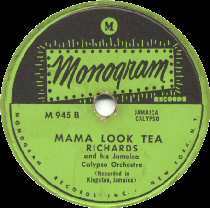 The Goldenaires released a middle period LP that sounded similar in this way. In September of 2005, I heard from Bill Casey, of Brisbane Australia, who had a copy of this disc in a picture sleeve with a colorized group photo on the front and liner notes on the back. Scans are to the right, courtesy of Bill. 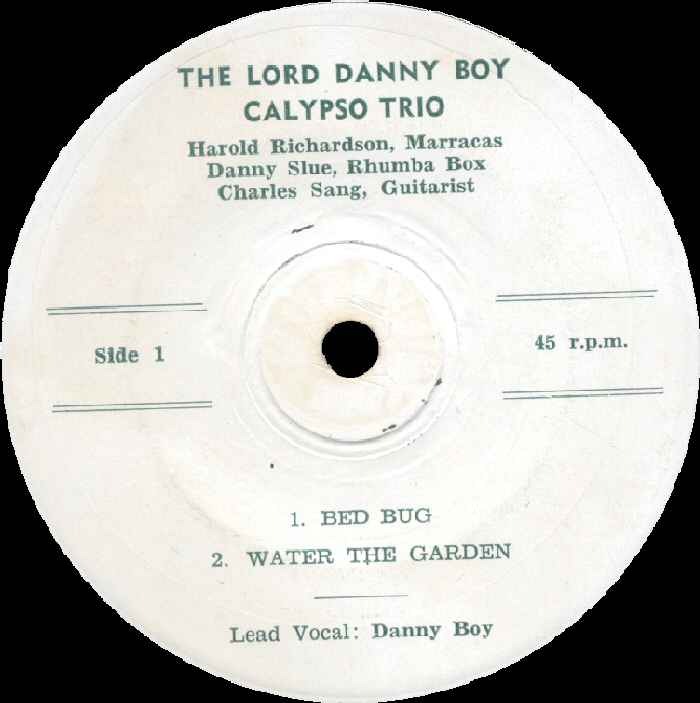 The Lord Danny Boy Calypso Trio recorded these songs in Melbourne, Australia. 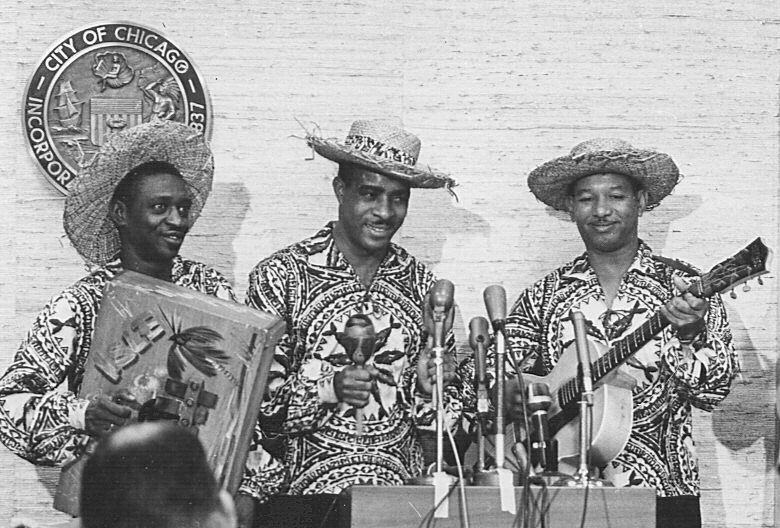 They were performing at a restaurant cabaret called Mario's. 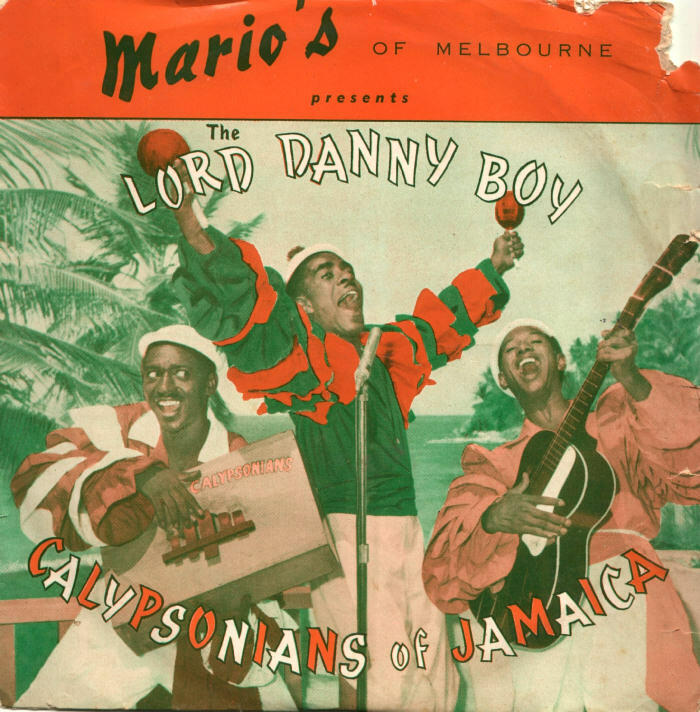 The prominence of the ‘Mario's of Melbourne’ banner on the cover, their residency at the restaurant, and the fact that the EP was sold at the venue all suggest Mario's was financially involved in issuing the record. 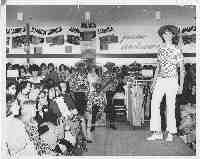 Not having 'Mario's' printed on the record label was almost certainly part of the deal. It meant that the trio could keep copies unsold during their residency and offer them for sale in plain white covers, (or even a new cover? ), at their next gig. The Melbourne TV channel, GTV 9, is mentioned on the back cover. 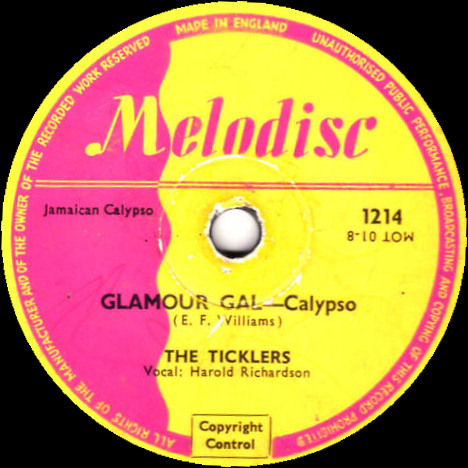 In 1960, the English Pye company, makers of TVs, radios, record players, and owners of the Pye record company, bought the GTV 9 license. Pye Australia established a Melbourne record company called the Astor label. 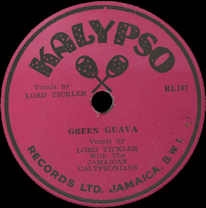 Astor recorded some of their artists at the GTV 9 studios. 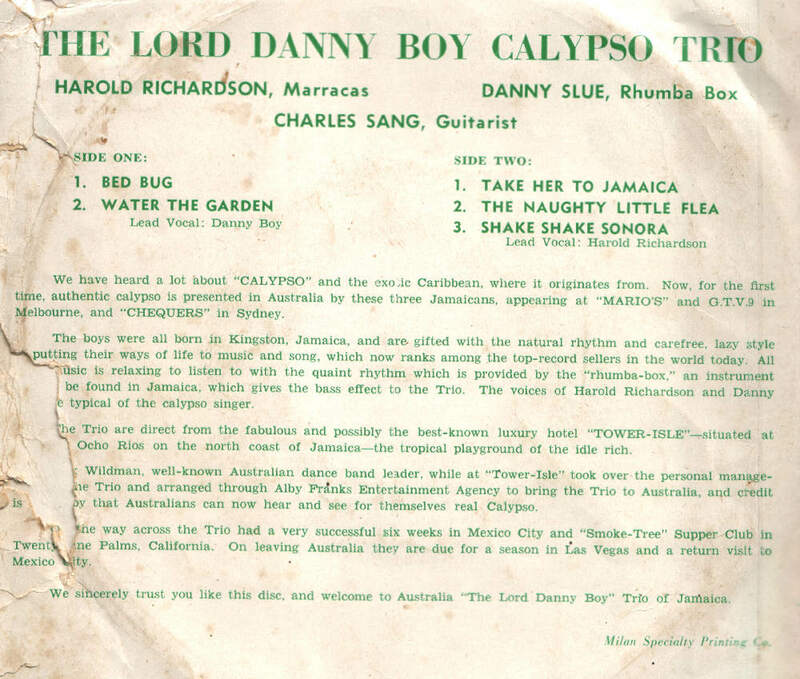 I'd suggest that was where the trio cut these songs - in what was once an old soup factory in Bendigo St, Richmond, a Melbourne suburb. 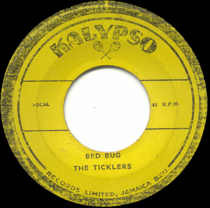 The recording date is 1960, although the cover doesn't provide that information. In 1960 the trio had an Australian manager, Wildman, a bandleader who had met them at Ocho Rios, Jamaica. Apart from Mario’s, the trio performed at Chequers, a Sydney nightclub, and were often on variety TV shows. There were no Australia-wide television networks in those days, so the shows (In Melbourne Tonight, In Sydney Tonight, In Brisbane Tonight, etc) were only broadcast to the city in which the studio was located. Australian interest in the West Indies during 1960 was running high. 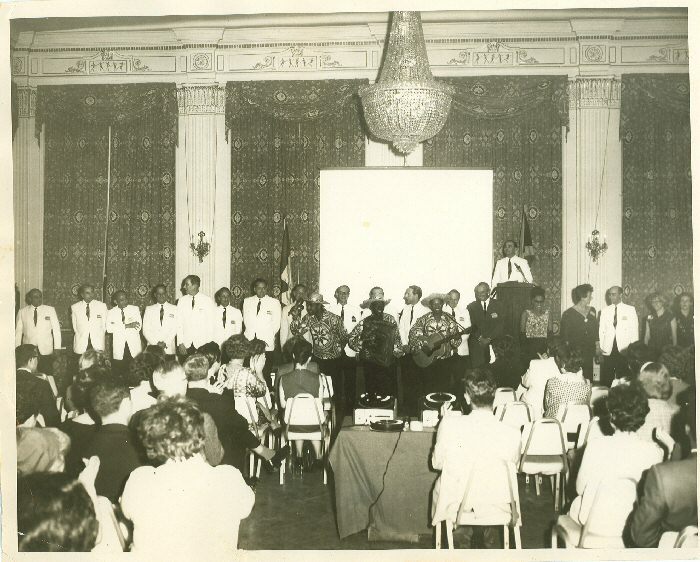 The Windies cricket side was due to tour at the end of the year. The tour was a spectacular success - not least because of the famous drawn test at Brisbane in December 1960. 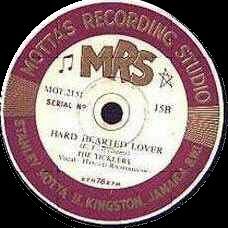 Another Jamaican act - Harriott & Evans, a male vocal duo - also came to Australia and recorded around the same time. 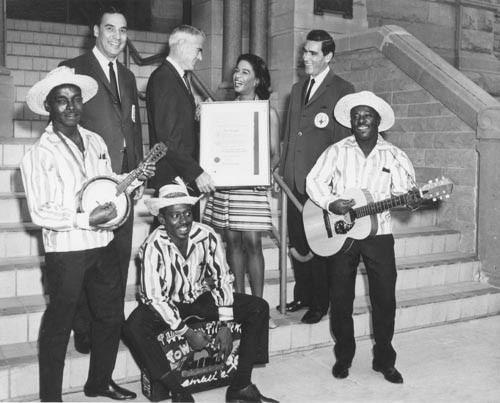 The cross-pollination of music styles in Australia is a fascinating area. 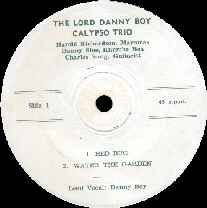 Calypso is rarely mentioned, but as the Lord Danny Boy Calypso Trio prove, the influence existed - a delightful cultural link between Australia and the Windies, and between calypso fans everywhere. Bill Casey, Australian Studies Centre, University of Queensland, Brisbane. 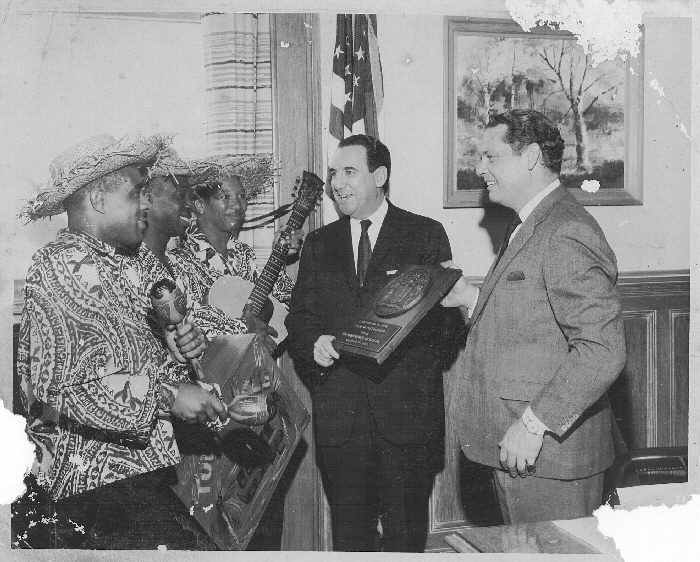 The "More Middle Period Album Scans" page for scans of another LP from the Tower Isle Hotel that include Harold Richardson performances. 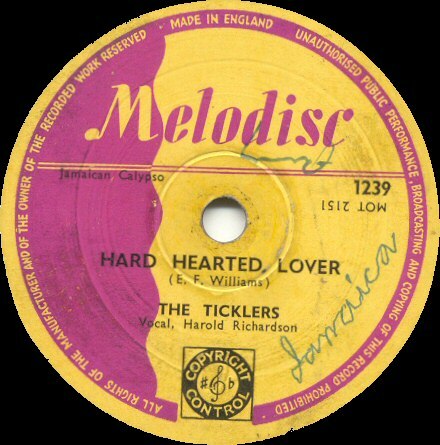 One of these LPs has Harold singing a ska track!